The Aloe Vera plant is known for its beneficial phytonutrients, including enzymes, vitamins, minerals, and amino acids. Nature’s Pro – a company devoted to only using plant extracts with a scientific basis – has created an organic aloe drink concentrate that combines all the best elements of the renowned succulent with natural herbs that have been concentrated with glycerin to maximize the properties of the active ingredients as well as to counterbalance the natural sour taste of aloe. Aloe Vera is known to have phytonutrients that can revitalize and stimulate the immune system. 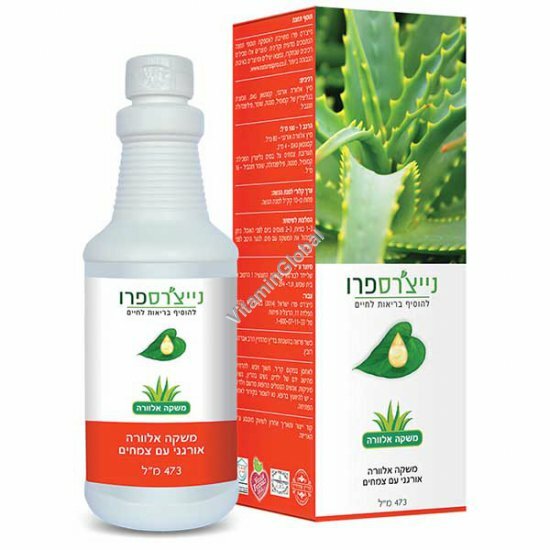 Aloe Vera drink is recommended for aiding cancer patients, diabetics, multiple sclerosis sufferers, and in general anyone with an immune deficiency. In addition, Aloe Vera is beneficial for the digestive system because it restores the mucosal lining, and thus improves gastrointestinal activity while reducing the negative effects of the body’s own attempts to heal the mucosal lining via over-production of enzymes – a phenomenon that causes hunger pangs and other intestinal discomfort, such as heartburn, spasms, and other gastro-intestinal inflammatory conditions. Aloe Vera extract is also rich in saponins, which have a cleansing effect which adds to overall gastro-intestinal well-being. Ingredients: Organic Aloe Vera Juice, Xanthan Gum, Glycerin-based herbal blend containing: Chamomile, Mint, Fennel, Filipendula (Meadowsweet), and Ginger. Directions: Shake well before use. Take 1-3 teaspoons 2-3 times a day before meals. The concentrate may be swallowed straight or diluted with water to make an aloe vera drink. Pregnant women, lactating women, people on medication and parents considering this product for their children - consult your physician. This information above is not medical advice. In case of a medical problem, consult your physician.